Nitrogen gas is colorless, odorless and non-flammable. It is non-toxic. The primary health hazard is asphyxiation by displacement of oxygen. Maintain oxygen levels above 19.5%. Contact with the liquid or cold gas can cause freezing of exposed tissue. Can cause frostbite (liquid form). Treat for frostbite if necessary by gently warming affected areas. Ventilate area. Monitor the surrounding area for Oxygen level. Oxygen must be at least 19.5% before personnel may be allowed into the area without self-contained breathing apparatus. If the area must be entered by emergency personnel, self-contained breathing apparatus, Kevlar gloves, and appropriate foot and leg protection must be worn. Never allow any unprotected part of the body to touch uninsulated pipes or vessels that contain cold fluids. The extremely cold metal of the container will cause moist flesh to stick fast and tear when one attempts to withdraw from it. Protect system components against physical damage. Check all hoses and transfer equipment before filling them with the liquid. Replace any worn or cut hoses prior to use. Liquid Nitrogen is extremely cold and is under pressure. A complete hose failure can result in a large release of Nitrogen and violent movement of the hose and associated equipment, which may cause severe injury or death. Special care must be taken when depressurizing and disconnecting hoses. Use storage containers, piping, valves and fittings designed for storage and distribution of Liquefied Nitrogen and vaporized (Gaseous) Nitrogen. Mechanical ventilation is satisfactory. Ensure oxygen concentration remains above 19.5%. Gas will dissipate in air. DOT and TC are the U.S. Department of Transportation and the Transport Canada, respectively, which assign DOT and TDG (Transportation of Dangerous Goods) identification numbers, hazard classifications, and proper shipping name and shipping label information. 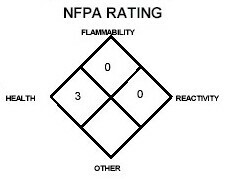 This material is hazardous as defined by 49 CFR 172.101 of the US Department of Transportation and Dangerous Goods as defined by Transport Canada Transportation of Dangerous Goods Regularions.